In 1920s, Mutt and Jeff were not only beloved comic-strip characters, but also the names of two of the best horses ever to pull a St. Vital fire wagon. The team was split in 1923 when St. Vital began to motorize its fire-fighting equipment and Mutt was auctioned off. Unfortunately for Mutt, his fate was to become food for the silver foxes bred by a south St. Vital farmer. The action triggered a number of angry letters from across Canada by writers who were incensed that Mutt wasn’t simply put out to pasture to live out his life. Fire officials were braced for more criticism two years later when Jeff, the last horse, was scheduled for the auction block. 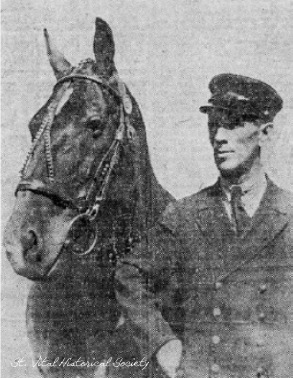 Sixteen-year old Jeff was the first horse purchased by the department and after 11 years of hauling the fire wagon, was the last of his breed still at the fire hall. “In his first few years of service, the clang of the fire bell would send up his ears, and his nerves would tingle to get into harness and away to the fire,” stated a Winnipeg newspaper dated Aug. 25, 1925. The clipping is one of several kept by H. E. Rose, who served as chief of the fire and police departments. “Mr. William Tod, himself a veteran of the municipality, was fond of Jeff and wanted to have him pensioned off, but he wasn’t successful,” continued the article which noted that his driver Victor Dawson was out of a job. Fortunately for Jeff, he didn’t meet the same fate as his partner. He was sold to a St. Vital dairy farmer.